Cambridge, UK, (2016) – BrightSign, LLC®, the global market leader in digital signage media players, and Mood Media, the world's leading instore media provider today announced that they are undertaking the world’s first roll-out of digital menu boards in over 50 Costa Coffee stores in Dubai. Costa Coffee is one of the top two coffeehouse chains globally. Emirates Leisure Retail selected Mood Media to provide the menu boards after a detailed trial phase. 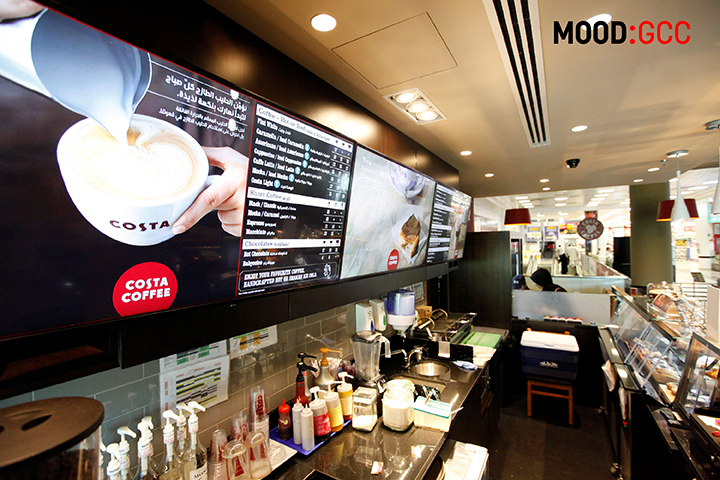 Mood Media already manages the audio experience in its Costa Coffee stores, providing background music. Commenting Shemaine Jones, Head of Marketing, Emirates Leisure Retail said, “We are always looking for ways to improve the customer experience. We spent six months evaluating digital menu board formats and content offline to create a formula that fully reflects our brand values and the store context. Only then did we move ahead with a pilot." The new digital menu boards were approved not only by Emirates Leisure Retail management locally but also by global Costa Coffee brand management in London before being piloted in a local store. The pilot was so successful that an immediate decision was taken to roll digital menu boards across Costa Coffee stores in The UAE. Digital menu boards are introduced as each store becomes due for refurbishment. Around half are complete at this point. Mood Media is now in talks to extend the boards to other Costa Coffee stores in Gulf Cooperation Council (GCC) territories. Commenting, Terry Borden, Managing Director, Mood GCC added, “We pushed for Costa Coffee to adopt the BrightSign platform as it is so intuitive, user-friendly and stable. BrightSign came through the exceptionally thorough trial stage with flying colours. With the full roll-out, BrightAuthor continues to provide a flexible and easy to use platform for managing and scheduling content playback in each store." Digital Communications LLD provided Mood Media with full Brightsign technical support during the trial, pilot and roll-out phases. Abdul Bakhrani, CEO of Digital Communications LLC, added, “We are delighted to have the opportunity to support this prestigious project, with one of the world’s best-recognised coffeehouse brands. The stability and reliability of BrightSign players makes them an ideal platform for this kind of project, which will be closely monitored by Mood GCC and Costa Coffee management." The complete roll-out calls for hundreds of BrightSign XD232 players. The XD232 offers an advanced video decoding engine with superior scaling technology that is capable of decoding two 1080p60 videos simultaneously. It is network-enabled and equipped with Power over Ethernet (PoE+). A hardware-accelerated HTML5 rendering engine enables flawless playback of multiple modular HTML5 assets, which can be layered along with Full HD video playback. The players are attached to the rear of each screen for neatness and convenience.